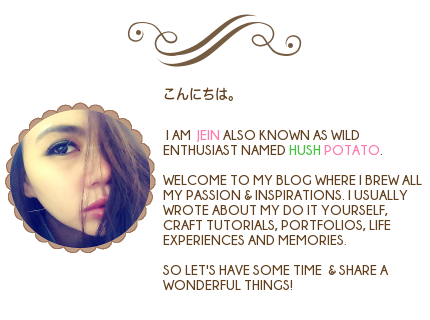 I just made my simple Blog banner. And I sincerely appreciate it. paano maglagay ng animation sa blog post? sorry lydes now ko lang napansin to. Anyways you can search glittlergraphics in google. You can copy and paste their codes. HUSH POTATO. ENTHUSIAST. ARTIST. MAKE UP. GRAPHIC DESIGNS. POLYMER/ AIR DRY CLAY. RIBBONS. HAIR ACCESSORIES. WOOD CRAFTS. HANDMADE. HOBBY. PASSION. JOURNEY. ADVENTURES. TUTORIALS. DIY. COLLECTIONS. INSPIRATION. GIVEAWAYS. FREEBIES. CREATIVITY. LAYOUT. FAMILY. FRIENDS. RE-MENT. PULLIP DOLLS. ANIME. PIG STUFF. MUSIC. MOVIES. KOREAN SERIES. LOVE. FASHION. DANCING. PHOTOGRAPHY. COCO. LEE MIN HO. YOON SHI-YOON. TOM HARDY. Hush Potato 2010 | www.hushpotato.blogspot.jp | Layout by Hush Potato Designs | All rights reserved. Powered by Blogger.